The Fitzroy Falls Spiny Crayfish is a rare species of Australian crayfish endemic to a small location on the NSW Southern Highlands. The species is only found in Wildes Meadow Creek NSW, surviving as a remnant population, restricted to a small length of the waterway upstream from Fitzroy Falls. The maximum reported size of the Fitzroy Falls Spiny Crayfish is 86 mm OCL and 300 grams. The Fitzroy Falls Spiny Crayfish is one of over 40 species in the genusEuastacus which represents freshwater 'spiny' crayfish. 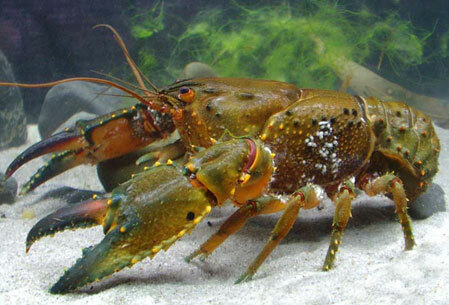 Euastacus is the second most widely distributed genus of freshwater crayfish in Australia, and contains many species with limited distributions. The Fitzroy Falls Spiny Crayfish is a relatively large, long living, non-aggressive species which is morphologically similar to Euastacus spinifer, the Sydney Spiny Crayfish. The Fitzroy Falls Spiny Crayfish in its natural environment may be confused with the common Yabby (Cherax destructor) which has been translocated to the Wildes Meadow Creek catchment from the Murray-Darling Basin. The Fitzroy Falls Spiny Crayfish can be distinguished by its larger size, and the presence of short robust spikes on its claws, carapace and abdomen while the Yabby is smooth shelled. If you think you’ve caught one, release it unharmed. It is illegal to catch and keep, buy, sell, possess or harm Fitzroy Falls Spiny Crayfish without specific approval. Penalties can include fines of up to $220,000 and up to two years in prison. Causing damage to the habitat of a threatened species without approval is illegal and penalties also apply. Report illegal/suspicious fishing activities online or call the Fishers Watch Phoneline 1800 043 536. Watch a video about a University of Wollongong honours project on the Fitzroy Falls Spiny Crayfish in collaboration with NSW Department of Primary Industries (4:29 mins).